Projects always running over? Coming in over budget? Projects not delivering what was expected? Not yielding the expected benefits of implementing project management software? Difficulty balancing projects and programmes alongside business as usual? Do any of these ring any bells? If you answered yes to any of these, then ask yourself this: In this ever more competitive world, how much longer can you afford to waste money on poor performing projects? Imagine you had the confidence that your projects are under control. That you could rely on projects delivering what is expected, on time and within budget. It is possible. Stop imagining and make it happen by taking action. To bridge the gap you need to improve your organisational project management. Project management methodologies have been evolving over many decades, yet organisations continue battling to deliver projects successfully and persistently struggle to achieve good value for money from their project management effort. In fact, organisations struggle to efficiently and effectively apply project management methodologies. How much pressure would it relieve if you could, very soon, rid yourself of the worry of out of control projects? What would it mean to you if your projects stopped going over budget and delivered what was expected, on time? With over 30 years’ experience in project management including the last ten in a consultancy role, I can work with you to improve or transform your existing project, programme and portfolio management framework, or work with you to design one that works for your organisation. Whilst projects (and programmes) can be complex, the framework for selecting and delivering your portfolio should not be. I have a very good track record of implementing simple frameworks (of processes, tools and templates) into small and large businesses throughout the UK, across many industries, which greatly improve value from investments. Together we can remove the disorder and mayhem that may currently exist and replace it with successful change that enables you to deliver on your promises. I can work with the relevant people in your organisation to realise this change and maintain it long after. If an important part of your business is to select and deliver projects (and possibly programmes), but you are not doing this effectively, then I can help. Perhaps you have implemented a project management software tool but are struggling to gain the expected benefits from doing so, or maybe you are thinking about investing in one. 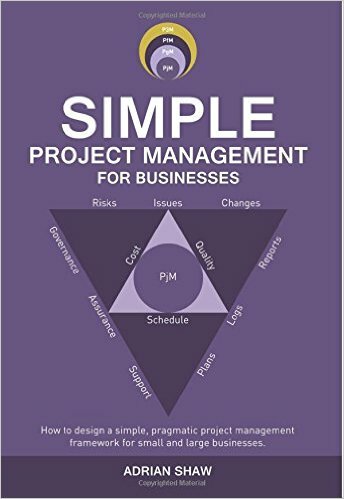 Or you might just be wondering how to go about improving your project, programme and/or portfolio management (P3M) capabilities in terms of People, Process, Organisation and/or Technology. Whichever, it is well worth starting with a short, cheap assessment (such as P3M3®, of which I am an accredited assessor), from which you will obtain a measure of your current capabilities as well as recommendations on how to improve in order to achieve higher targets and reap the rewards of doing so. The recommendations will include those for People, Process, Organisation and Technology. To discuss or arrange a short, cheap assessment (P3M3® or otherwise), please contact me. I am conveniently based in Milton Keynes and serve clients in the Buckinghamshire, Hertfordshire ad Bedfordshire areas. As a small business, I don’t have the large overheads of some larger consultancies, which reflects in my pricing. Optimise the delivery of your projects today. Call me on 07725 950775 or email me at adrian@SimpleP3M.co.uk. 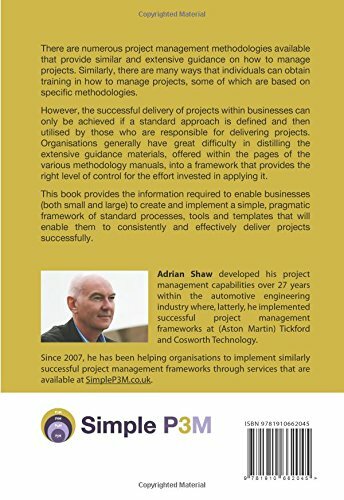 This book provides the information required to enable businesses (both small and large) to create and implement a simple, pragmatic framework of standard processes, tools and templates that will enable them to consistently and effectively deliver projects successfully. This short video outlines my SimpleP3M System that will enable you to improve your organisation’s project, programme and portfolio management (P3M) capabilities. These slides illustrate the high level of my SimpleP3M System which enables organisations to implement simple, pragmatic project, programme and portfolio management (P3M) frameworks (of processes, tools and templates) that optimise control and invested effort. Start the process today and contact SimpleP3M using the form below. I would like to receive helpful tips in the future via email.